Foster Web Marketing is excited to announce that we have been spotlighted as one of the top SEO companies on Clutch. Clutch is a Washington D.C. research firm that evaluates B2B companies across the tech and digital agency space. Their recent report highlighted Foster Web Marketing for excelling in SEO, Web Design, and Advertising and Marketing, particularly noting our work in the legal, business services, and healthcare industries. At Foster Web Marketing, our mission is to provide effective online marketing solutions tailored for law firms and medical practices. We understand what it takes to successfully market to these industries and are pleased that others are taking note of our work. “In an increasingly digital world, SEO and PPC are critical tools to elevate your brand’s online visibility and reach a wider target audience than traditional advertising permits,” said Sara Philibotte, business analyst at Clutch. “We compiled a carefully vetted list of top SEO and PPC agencies informed by market research and in-depth client reviews. If you’re searching for a partner to help you drive sales, we recommend selecting from these teams with demonstrated success and verified expertise." With hundreds of firms evaluated on Clutch and given the importance of SEO in today’s age, receiving this recognition is something our team is extremely appreciative of. 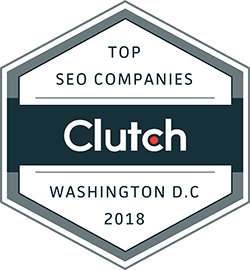 Clutch’s sister website, the Manifest, has also recognized us for our digital marketing, web design, and legal SEO work in their new research. We would like to express our gratitude to all of our clients who have provided Clutch with such positive reviews regarding our work. We could not be prouder of our collaborations with them and are excited to see what’s next for us!